I got to sew Friday night with Bonnie Hunter on Quilt Cam, the computer was next to my machine as I sewed and listened to her. Her blog is Quiltvile. I think she said her next Quilt Cam might be Sunday at 2 pm eastern. I love joining her when I can, it feels a little like a mini quilt retreat. The spools on the top left are from Bonnie's web site and are a leaders and enders challenge. I got my 5 purple Sprout block done Friday night. The sprout pattern can be found on Tracy Jay Quilts. I was having a little trouble getting the pink scraps put away and did three more pink crumb blocks to go with the two on the bottom I did earlier in January. I also got the two light purple crumb blocks done this week. It takes a long time to sort and kit up my scraps. I have 16 patches and butterflies and more spools to do yet this month. I have added today's post to Soscrappy were the Rainbow Scrap Challenge 2013 is hosted each and every Saturday. January was pink and February is purple. Cathy, a whole lot of nice blocks happening there. I might have to tune into one of those Quilt Cams, sounds like fun. So glad I'm not the only one still finding pink scraps lurking about. They look great next to your purples. Still 2 more Saturdays to work through them all. Great blocks! I had trouble putting the pink scraps away too! Lots of pretty blocks. Love your sprouts in the dark purples. The crumbs are so cute... I have pink lurking around still waiting for crumb week! Those sprout blocks are really cute; I find myself wondering how you'll set them in a top. I too love Quilt Cam; it's great fun to watch Bonnie's process, and she gives good tips and is always so cheerful and upbeat! You are on a role so far, still have more than half the month to go. You will make it, keep sewing one stitch at a time. Cathy, thank you so much for being such an inspiration. I have started my own Sprouts quilts, by digging into my colour wash bin. The squares there are 2" so my over all sizes are smaller, but still so delightful. 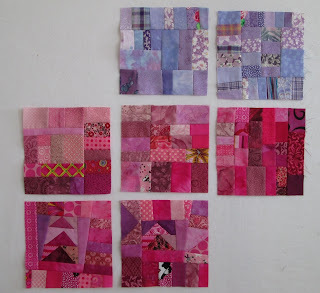 I made 5 pink ones last night (Saturday...what else is there for a single quilter to do on a Saturday night) and now Sunday I continue to work on my Farm Girl at Heart while using purple Sprouts as my leaders and enders. Quilt on my friend! You have been busy, Cathy! NICE blocks. 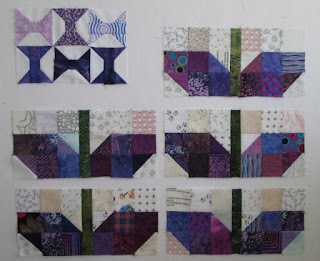 You have some beautiful purple blocks going on here Cathy :) It's amazing how long it takes to sort scraps into blocks.